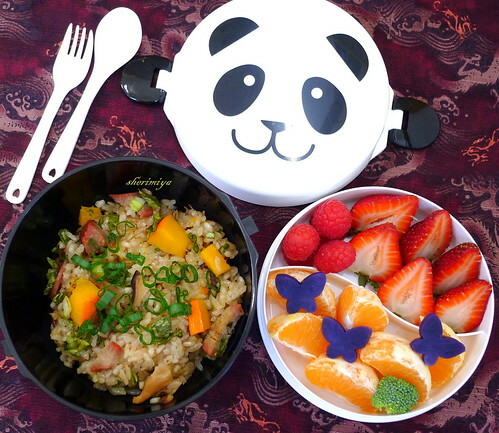 Sticky Rice Panda Bowl Bento, a photo by sherimiya ♥ on Flickr. Added to Allergy Friendly Lunchbox Love. I don't know how you continue to come up with these wonderfully creative bentos. Seriously. I try and try and can only manage a mangled, unrecognizable animal-ish-like shaped pancakes. Actually, they look more blobbish than anything else. I'm JELLY. Yobodish -- your delicious food doesn't need any cute animals; it gets eaten too fast anyway! Actually I want you to come over and cook us some kimchi jjigeh! Chantale -- me too I love all rice meals. And I'm all about the gojuchang (sriracha, etc) too! Thank you Lyn! I hope you like the recipe; you can adapt it as you like! How many bento boxes do you have? It's so fun to check what you have been cooking Sheri. I don't know how you come up with so many ideas... I think you really have fun making bento that's why always something new and something so inspirational! I'm so jealous over the panda box. You always make lovely colorful bentos and this one is no exception, it looks great! Oh, and Nami, I have stopped counting my boxes. Let's just say there are more than 50. I love sticky rice too and I usually order some whenever I visit my local dim sum restaurant. Cute panda box:)! Me too, thanks Cooking Gallery!